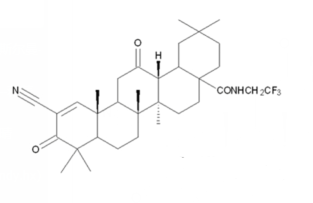 Ezetimibe Ketone is Phase-I metabolite of Ezetimibe. Dihydro-CDDO-trifluoroethyl amide (dh404) is a novel Nrf2 activator and suppresses oxidative stress in cardiomyocytes. 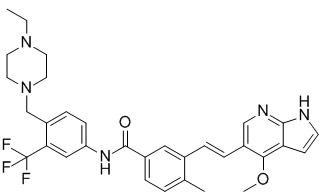 HG6-64-1 is a potent and selective B-Raf and mutant B-Raf inhibitor.HG6-64-1 is a potent dual TAK1 and MAP4K2 ((germinal center kinase, GCK)) inhibitor with IC50 of 41 nM and 98 nM, respectively. K67 is a specific inhibitor of the interaction between S349-phosphorylated p62 and Keap1, exhibts no inhibitory effect on the interaction of full-length Keap1 with Nrf2-ETGE or full-length Nrf2. Sulforaphane is an inducer of chemopreventative enzymes via Keap1-Nrf2 signaling. Sulforaphane is present naturally in widely consumed vegetables and has a particularly high concentration in broc-coli.